'A sine qua non for Joyceans' (Clarence Sterling). 'Certainly the best intro to the Wake I've seen' (Andrew H. Blom). This lively and readable essay provides essential background information and helpful reading techniques. I bought several books when I decided to read Finnegan's Wake. This has proven to be the least helpful. I would recommend Joyce's Kaleidoscope: An Invitation to Finnegans Wake,Joyce's Book of the Dark: Finnegans Wake (Mark H Ingraham Prize),A Skeleton Key to Finnegans Wake: Unlocking James Joyce's Masterwork,How Joyce Wrote Finnegans Wake: A Chapter-by-Chapter Genetic Guide (Irish Studies in Literature and Culture), and Annotations to Finnegans Wake -- in that order before A Word in your ear. Kitcher's invitation has especially reawakened my interest in the dark book. I find myself in that late stage of life when I wonder, with HCE, ALP and Joyce if it's all been worth it. It's good to find a new book on "Finnegans Wake," the first I've seen in this century. Most of the books written about Joyce's last "novel" were written a generation or more ago. This compact text is comprehensive and adds thoughts and ideas I've not found in some of the older, more voluminous works. It's also readable, not requiring an advanced degree in literary criticism. 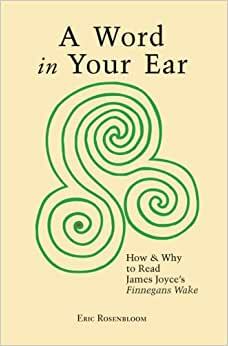 There's no way to make "Finnegans Wake" an easy read, but "A Word in Your Ear" offers practical advice that advances our understanding of Joyce's "book of the dark."